Wool is infamous for being an itchy fabric. Merino wool however, is a different story. The "itchiness" people associate with wool is determined by the diameter of the fibers used. Larger, broader fibers are less flexible and have less ability to bend, which results in a prick when pressed against the skin, causing the sensation of itch. Merino wool is able to ditch the itch thanks to its fiber's smaller diameter, or being "finer". These fibers are more flexible and softly bend when pressed against the skin and, therefore, don't itch like other wool. These finer fibers also enhance wool's elastic nature, making garments made with Merino wool more able to conform to the shape of the body they're on, enhancing the garment's performance and the wearer's comfort. The drying time of a fabric is controlled by two factors: 1) the amount of liquid moisture held between the fiber matrix when it starts to dry and 2) the humidity and temperature of the surrounding atmosphere. Generally, the thicker the fabric, the more moisture it's able to retain and the longer it takes to dry. Our fine-spun Merino wool fabrics dry as quickly as any performance synthetic fabric of comparable weight. SPF and UPF are often thought of similarly. UPF stands for UV Protection Factor and is a measurable of how much UV light a fabric blocks. In a paper first published in BMC Dermatology 2001, Consultant Dermatologist Dr. Thilo Gambichler investigated 236 apparel textiles used in spring and summer clothing collections. and that was Merino wool. In fact, Merino's poorest sample produced a result of UPF 40+, while more than 70% of the Merino samples had a UPF 50+. Merino wool has hygroscopic characteristics that allow it to absorb and release moisture from the air. The movement of moisture through wool fabrics is controlled by the difference in the moisture content of the air between the skin and the fabric and the moisture content of the fabric itself. Wool "breathes" by maintaining the equilibrium of moisture between itself and the surrounding environment. Its fibers constantly absorb or release moisture from one environment (such as inside your shirt during exercise) to another (outside your shirt). Wool fibers move this moisture while it's still in a gaseous form. Meaning, as your body heats up, the moisture vapors will be absorbed by the wool fiber, and released to the drier environment outside of the fabric; releasing heat and keeping the wearer dry and comfortable. A Merino fiber can absorb and retain up to 35% of its own weight in moisture and still feel dry to the touch. 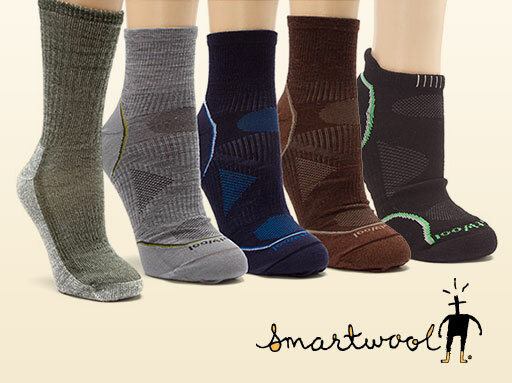 Get into Fleet Feet Sports Madison & Sun Prairie to check out all of our SmartWool products!